The engraver, in the frontispiece to the last number, printed Wisteria on the plate instead of Wistaria. The plant was named after Dr. Caspar Wistar, and it should always be spelled with an a instead of an e.
One of the handsomest rustic ornaments we have ever seen, was thus simply constructed: A tall red cedar was transplanted from the woods, its branches all trimmed back to within two or three feet from the trunk (broadest at the base near the ground, and tapering gradually toward the top), and all the bark peeled off, leaving the wood entirely bare. Two of these were placed by a gate-way, just within the fence, one on each side of the path. At their base was planted a Wisteria, which, feeding on rich food, was most rampant in growth, soon reaching to the top with its fast climbing tendrils. 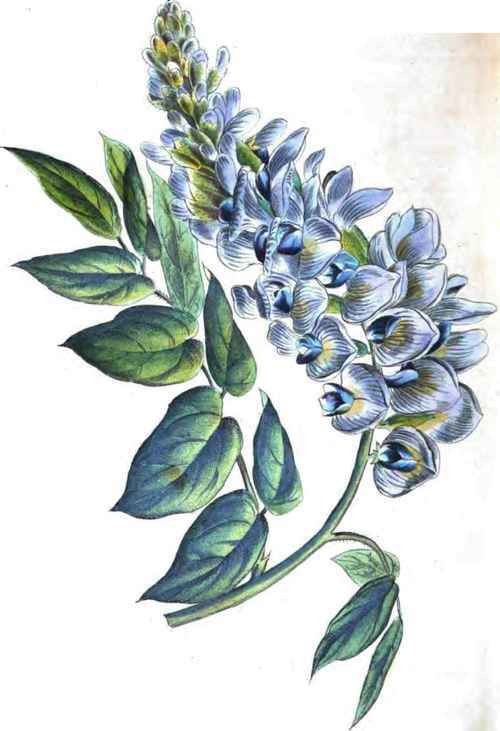 The leafy foliage soon covered the extremities of the dead wooden branches, and sending out runners which circled out, and downward, in a pendent form, covered in June with the densest of delicate blue blossoms, made a picture of rare grace, and a unique rural embellishment. By pinching off the ends of those runners, which hang out from the main stem in half circles, they became more stout, and the entire structure appeared more like a tall shrub, than a vine on an artificial frame. Few know how really elegant such a contrivance is until they have tried it. Among the various plans which gardeners occasionally give us about training vines, is the following: Train the Wisteria to a stake six feet high, and when the main stem has reached the top, head it off. The second year, or the third, will find it able to support itself, and forming an umbrella-shaped head, with hanging flowers. The more we can encourage such little contrivances as these, the greater the pleasure in gardening.